Bengeance: Is the Kindle a Perfect Traveler's Tool? Is the Kindle a Perfect Traveler's Tool? As you probably know, the Kindle is Amazon's ebook reader. As you probably also know, earlier this week they announced version 2 of the Kindle. If I were just sitting around at home, I'm pretty sure I'd never buy a Kindle. 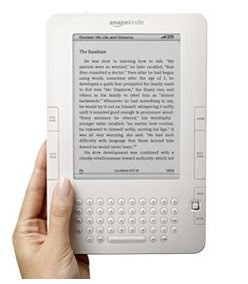 As far as I'm concerned, an ebook reader does not replace actual books, for two main reasons. First, I like books as physical objects. I like holding them and paging through them and seeing them on shelves. I like the way they smell. But second, and more importantly, as long as ebooks are laden with DRM, they have to be treated as if they have an expiration date, which means that I'm never going to build a library of ebooks. But that doesn't mean that an ebook reader can't still be a valuable tool, perhaps well suited for some particular purpose. The purpose I have in mind is "making my backpack lighter." When I'm traveling long term outside of the US, my pack typically weighs 20-22 pounds, with three to four books making up a significant chunk of that weight. I am usually carrying a phrase book for the country I'm in, a guidebook for the country I'm in, a non-guidebook book about the country I'm in (a history, for example), and some random book unrelated to travel. If the four books weigh only eight ounces each (unlikely), that's still two pounds, or roughly 10 percent of the weight that I'm carrying, which makes the 10.2 ounce Kindle awfully tempting. From a traveler's perspective, the Kindle certainly does a lot of things right. It's small and light. The battery lasts for weeks. It can be recharged over USB while checking your email in an internet cafe, eliminating the need to carry the additional weight of a power brick. And it would make available a vast selection of English language books in places where it is typically difficult to find such things. (Once in rural Laos I was so desperate for something to read that I started rereading "Zen and the Art of Motorcycle Maintenance" because it was the only thing I could find in English.) Could this little wafer of plastic solve all my problems? Well... no. First, while Amazon offers 230,000 books available for download to the Kindle, they do not carry my guidebooks or phrase books of choice. Second, when a guidebook is paper, you can wake up in Marrakech in the morning, tear the few Marrakech pages out of your Morocco guidebook, stick them in your pocket, and leave your hotel for the day without carrying any bag at all. And phrase books also typically fit in a pocket quite easily. A Kindle on the other hand would require a bag. And third, fer cryin' out loud, I already stand out enough as it is. I try to keep a low profile and look like I fit in. It's impossible in many places, but whipping out an exotic electronic device when I need to check a map or figure out how to say "How much for the monkey?" certainly wouldn't help. All of which means that, at best, the Kindle could only replace half of the books that I carry. So, is it worth it? I'm leaning towards no. But if I end up in the Atlas Mountains with nothing to read but "Zen and the Art of Motorcycle Maintenance," I swear to you I'll recant my sins and promise eternal fealty to Amazon. Hmm. Good points. The DRM is the biggest brick wall for me. Maybe they should make a smaller, dual screen (folding) Kindle with a leather cover. It'd feel like a book, smell like a book, look more like a book, etc. The major difference would be that you don't flip pages. It'd also make it less likely to get a cracked screen when being lugged around in a full backpack. I'm not interested in the Kindle for a lot of the reasons you mention, but it IS nice to have something smaller when you travel. If you don't mind reading the classics on a 3 inch screen (you get used to it), I've found my smartphone to be a good way to go. I'm one of the seventeen people left who still have a treo, but there are a ton of options. If you get one with a simcard that you can swap out, you can also make it work as a phone in most countries. You can even get data in some places, so you can look up local info (although it doesn't necessarily replace a guidebook). Best of all, it's always with you. I carry half a dozen free, classic novels with me all time, because you never know when you're going to need a little Thackeray. "...you never know when you're going to need a little Thackeray." Maybe, but it was truly more awesomer when you said "How much for the monkey?" And can you send one to Kelly? I'm sure Jodi would appreciate it. I think it's awesome that my offhanded blog humor prompted you to research monkey ownership. I haven't heard of "God and the Art of Volkswagon Repair," but it can't possibly be worse than "Zen and the Art of Motorcycle Maintenance." My theory about ZatAoMM is that anyone who says they like it hasn't actually read it. As you well know, since writing this post I have become the proud owner of a Kindle, and I have to admit, I've been liking it an awful lot. One great benefit that I hadn't thought of ahead of time: it's great for reading while eating, because it will just sit flat on the table in front of you, and you don't have to hold the pages open. That's so true!! I was still debating, but now I'm pretty certain that a Kindle is going onto m list of things to buy when I make my first million.